We all know the story of the tortoise and the hare. The cocky hare races boldly and confidently ahead of the single-minded tortoise. The hare, resting on his unwon laurels, takes some detours; he has a lot of time — that tortoise isn’t gonna catch up with him anytime soon. 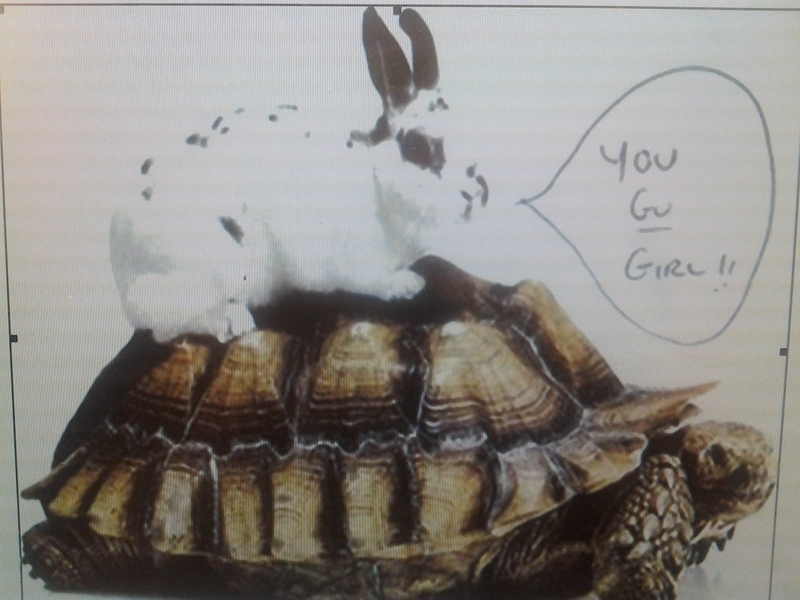 While the hare is off track, the tortoise, even at his slow pace, manages to win the race, much to the hare’s chagrin. As fast as I was to start something, like the hare, I rarely finished. Linda would finish everything regardless of how long it would take her. She is a patient gardener who grows incredible pumpkins every year; I get excited when the tomato plant sprouts, but I do not have her kind of patience that sees the plant to fruition. My plants die. In the past, I prided myself on my ability to do things fast. I always thought that was a good quality; but deep down, I was and am still envious of my sister’s ability to continue one project and see it through. Now that life has dealt its cards, I find myself in circumstances that push me to be a plodder, to be a tortoise. I am happy and wise enough to know that an opportunity is just what I need; but, honestly, I am terrified that it just isn’t in me to be focused on one thing for a long period of time. My friend posted this quote by Eddie Rickenbacker on her Facebook the day I had to make a very hard decision, a decision I was afraid to make: “Courage is doing what you’re afraid to do. There can be no courage unless you’re scared.” That quote encouraged me that I can do this, this decision that required the persistence of a tortoise. Another one of my hare-like qualities was spending my money quickly. One of my resolutions this year was to be more focused, more tortoise-like with my spending, and try to foresee my needs instead of just burning through what I think is extra dough. I am proud to announce that I made it to the end of the month without running out of toilet paper, soap, shampoo and toothpaste. Yay!! So here I sit, a frustrated hare, a tortoise wannabe, but one with a slow growing hope. How does a hare become a tortoise?? I will tell you as soon as I find out! !